….Photos of birds taken as an ongoing collection. The Townsend’s Solitaire is a slim gray bird with a white eye-ring, white sides on the tail, and buffy wing patches. They are in the Thrush family, and have a long tail. As the name applies it is usually seen alone. It has a range of Alaska, northwestern Canada, and the western United States. In the winter it ventures eastward to the Great Lakes and New England. It has a habitat of conifer forests in mountains, rocky cliffs; in winter, junipers, open woods, brush, and wooded streams. It eats mostly berries and insects, and may hover momentarily while plucking berries and insects among the foliage. The tree on which this Townsend’s is feeding is known as a Amur Cork tree and is native to the Amure River area of Manchuria. The Bohemian Waxwing is similar to the more familiar Cedar Waxwing except it is grayer, has no yellow on the belly, has wings with stronger red, white, and yellow markings, rusty coloring around the head, and deep rusty undertail coverts (cedar is white). It is slightly larger than the Cedar Waxwing, being 20 cm where the Cedar is 18 cm. Its range is northwest North America, but winters southwest to northeast in a band to Canada and Maine in the United States. It has a habitat of boreal forests consisting of pines, spruces, and larches that are found in Canada and Alaska. In winter it can be found is search of berries. Its diet is mostly insects and berries. 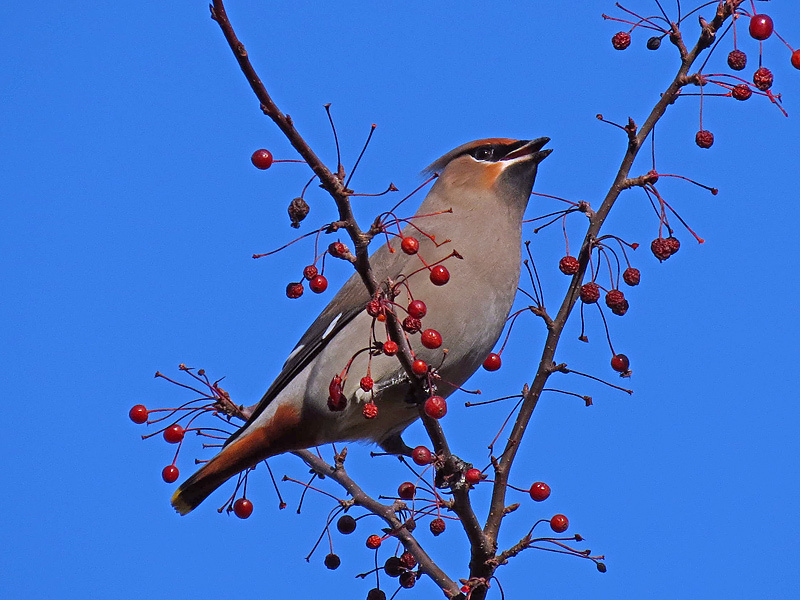 There were found two to three Bohemian Waxwings with a flock of Cedar Waxwings. They had to be photographed quickly while feeding on berries, as they quickly departed to set within branches and leafs of taller trees. To compare the Bohemian Waxwing with the Cedar Waxwing select the select the link below. 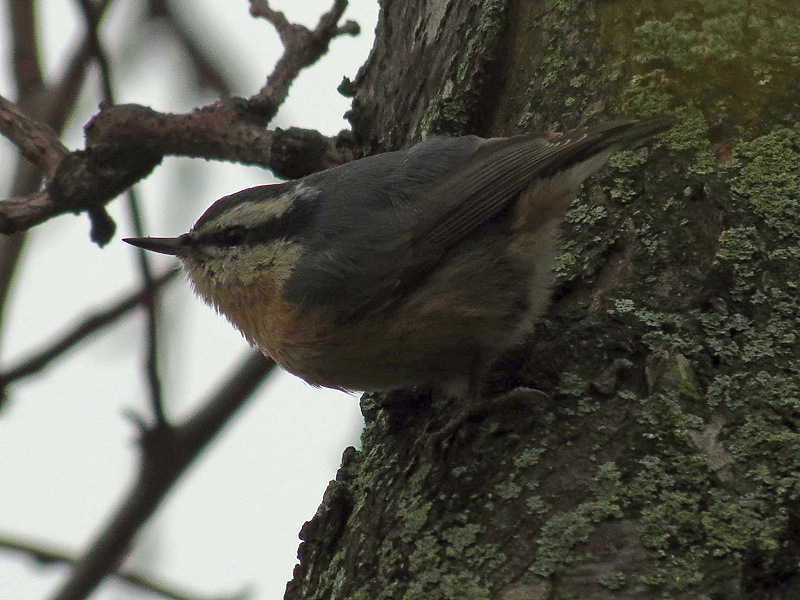 The Red-Breasted Nuthatch has a gray back, a black cap, a white stripe above the eye, a black stripe through the eye, and rusty underparts. It is compact, short tailed, and strong clawed. They nest further north and higher in the mountains than their relatives the White-Breasted Nuthatch. It has a range of southeastern Alaska, Canada, and western and northeastern United Sates. Its habitat is conifer and other trees. The diet is mostly insects and seeds. 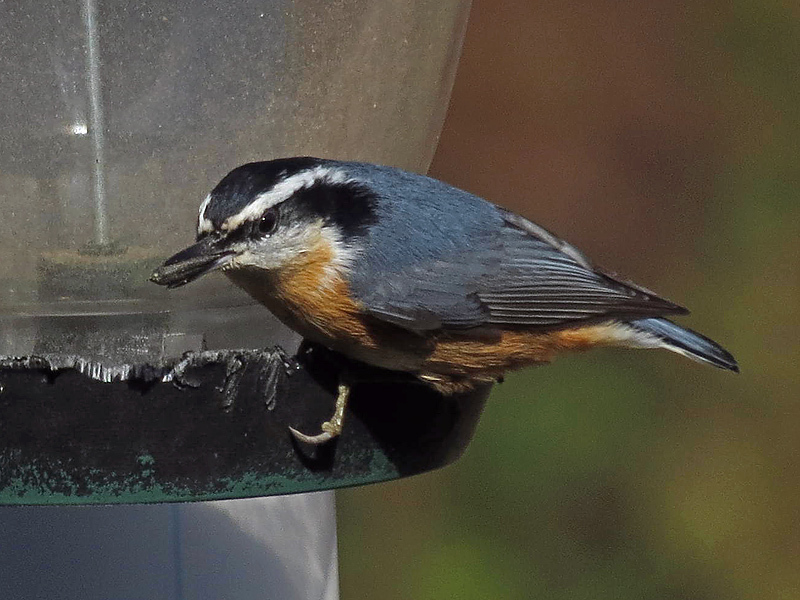 The Red-Breasted Nuthatch came to the feeders with other White-Breasted Nuthatches and Black-Capped Chickadees. The Bird Point is a working site that is presented to keep track of birds that I have photographed, and for their recognition, so that they are labeled properly, and corrected if required.